This was the first time that I visited Oregon. It exceeded my expectations in so many ways. I love the lush majestic mountains. The waterfalls that were created by the Ice Age Floods were extraordinary. 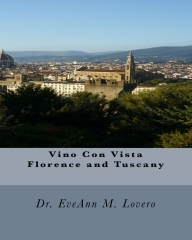 The farmland is cloaked with beautiful vineyards and fruit trees. There are plenty of cultural and historic sites to see. The food and wine was incredible with plenty of world-class chefs and award-winning restaurants. 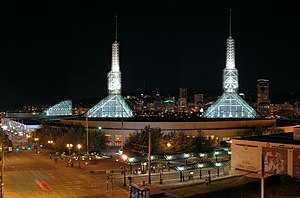 Portland is brimming with food carts and fabulous bridges. 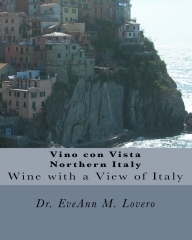 This lush oasis reminded me of Italy and ultimately became one of my favorite Vino con Vista wine tourism destinations! I went to a conference with over 370 wine bloggers who registered for the 5th annual Wine Bloggers Conference 2012 in Portland, Oregon. In addition, there was a long waiting list of bloggers hoping for a spot to open up in this cool climate varietal wine-lovers paradise. The bloggers that were fortunate enough to participate in the conference were invited to a lavish five-course dinner and wine pairing hosted by Oregon’s King Estate Winery headquartered in Eugene Oregon. 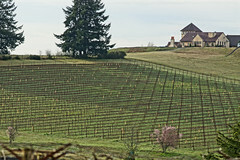 King Estate Winery is Oregon’s largest vintner and is located 118 miles south of Portland. I loved the Wild Chinook Salmon with garlic sausage, potato gnocchi and buttered leeks paired with the 2012 King Estate Signature Pinot Noir. Ed King, the CEO and Co-Founder of King Estate Winery is a marketing genius! He was instrumental in propelling his brand to new heights by sponsoring an elaborate wine dinner for bloggers. The dinner began with a well-crafted cutomized video. In the video, chef Michael Landsberg described the elements of his five-course dinner; click on the link to view the video: http://wbc.kingestate.com/. There are recipes and video demonstrations for each of the 5 courses. When you add up the number of followers that almost 370 bloggers can immediately communicate with via Twitter, Pinterest and FaceBook it is readily apparent that the number of people who learn about the King Estate wine brand will immediately grew exponentially. After all, this is about the business of wine! 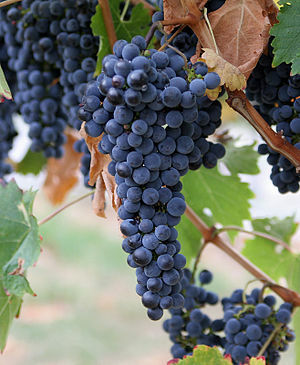 As Oregon wineries leveraged the power of Social Media, the social media activities served as block-buster brand-building marketing strategies for King Estate and the other participating wineries like provacative Naked Winery, Phelps Creek Vineyards, Viento Wines, The Pines Vineyard and Cathedral Ridge Winery. These winemakers have an opportunity to differentiate their brand and hopefully gain market share in this fragmented wine industry. The King Estate Twitter tsunami generated a Social Media fenzy for the King Estate Winery. King Estate Winery was trending world-wide on Twitter during the event! The subsequent explosion of tweets demonstrated the impact of social media. This is exactly why the Oregon Wine Board and vitners like King Estate, The Pines, Viento, Phelps Creek, Naked Winery and other Oregon vitners got involved in the 2012 Wine Blogging Conference. 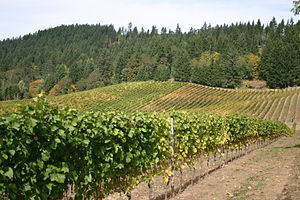 Many wineries are located in the Pinot Noir Triangle of McMinnville, Dundee and Carlton. 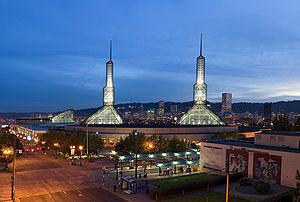 The Oregon wine estates extend far beyond this region. I loved the fabulous wineries in Hood River Oregon. The Oregon vitners hoped to enhance their brand recognition by personally connecting with wine bloggers. This strategy was very effective! By sponsoring or participating in the 2012 Wine Bloggers Conference, Oregon’s wineries and wine-makers hope to ride the wave of today’s social media phenomenon using blogs, Twitter, Facebook, Pinterest and YouTube. The WillaKenzie Estate in Yamhill Oregon hosted a group of bloggers for dinner before the conference began. 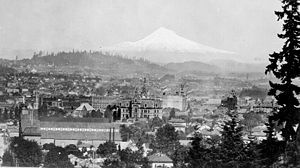 In addition, there were a series of affordable overnight pre-conference excursions to Washington County, Eugene, Salem and Hood River. At the Thursday night reception, more than 50 Oregon wineries gladly poured Oregon’s finest selections of Pinot Noir and other delightful regional wines. On Friday evening, tour buses filled with eager bloggers departed for lavish wine dinners at seven local wineries. Our tour bus brought us to the Phelps Creek Vineyards for a wine dinner hosted by the Oregon Wine Board. We took a hayride to the crushpad where we dine in the magical glow of Mount Hood. 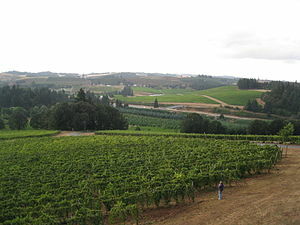 This unique AVA is less than 60 miles east of Portland with terroir that generates an amazing diversity of grapes. I loved the gorgeous Phelps Creek Vineyards. I also loved the Bob Morus story. Learn about how he came from Chicago and fell in love with Hood River by watching this video: http://www.vinestories.com/video.php?video=1537447585001. By the way, when Bob isn’t in his vineyard, he’s a commercial pilot. Phelps Creek, Viento, Naked Winery and The Pines were pouring their magical concoctions for the wine-loving bloggers. For dessert we were able to drink some “2009 The Pines Sweet Sierra” which I believe Lonnie Wright (the owner of The Pines) named after his daughter Sierra; maybe it was the winemaker Peter Rosback that came up with the appropriate name. Between Lonnie leaving Indiana, and Bob leaving Chicago, I even thought about staying in this magical place called “The Fruit Loop.” The area is cloaked with fruit trees and wineries with Mount Hood in the background. But if I stay, who will teach my college students? Maybe I can retire here and open my own winery some day. Then they wined and dined us at this heavenly spot as we gazed longingly at snow-capped majestic Mount Hood. We had appetizers and wine in the vineyard and then we took a hay ride to the crush pad. I completely understood why Lonnie never wanted to go back to Indiana! I loved the braised beef shortrib with fresh poch beans and hierloom pepper carrot sauce. 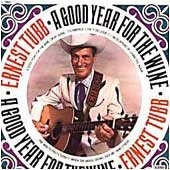 This was paired with the 2010 Pines Old Vine Zinfandel, the 2011 Viento Barbera and the 2012 Naked Winery Tempranillo. We were also served a Reister Farms lamb loin with Vans Cherry chutney. It was paired with a 2008 Phelps Creek Cuvee Alexandrine and a 2009 Cathedral Ridge Pinot Noir. Wineries poured interesting wines from regional wineries including: The Pines, Phelps Creek, Viento and Naked Winery. The food was incredible! All weekend, there were late night parties in private suites hosted by members of the wine industry. 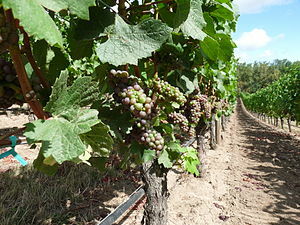 By getting social with bloggers, bloggers have an opoortunity to engage their social media fans and followers with news about Oregon’s cool-climate varietals like Pinot Noir, Pinot Gris, Pinot Blanc, Riesling, Chardonnay and other interesting Oregon wines being produced in Oregon like Barbera. This type of Social Media Stategy is highly cherished by the $2.7 billion Oregon wine industry with “849 vineyards and 419 wineries.” (National Agricultural Statistics Service). Many wineries gladly uncorked some of their best vintages for bloggers to taste. Many other wineries took advantage of the social media possibilities that bloggers offer with personal invitations to their wineries and tasting rooms. 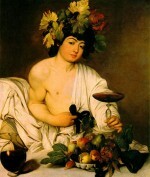 http://www.wineanorak.com/wineblog/. Goode is an author and journalist with a highly regarded website. Next year the Wine Bloggers Conference will be held in another fabulous Vino con Vista Venue; Penticton, BC. I plan to meet some of my new wine-blogging buddies there! I am a business school professor and former Dean who teaches Strategic Management and International Business. 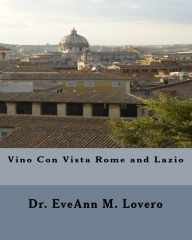 I encourage my students to use Social Media to enhance their “Digital Reputations” @ www.eveannlovero.com. 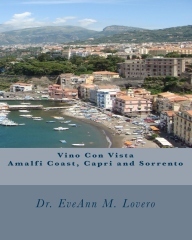 I also blog and write Italy Travel Guides and Travel Apps @ www.vino-con-vista.com. What’s a wine blogger worth? Vieux Château Certan scored well in 2018. The top scoring wines are 'clearly incredible'... The post Best Pomerol 2018 wines: A ‘signature’ year appeared first on Decanter. Château La Vieille Cure is an estate to watch in 2018, says Jane Anson. 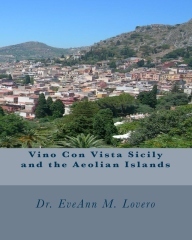 Step outside of the major appellations... The post Médoc and Fronsac 2018: Hidden gems appeared first on Decanter. The 2018 harvest underway at Sigalas Rabaud.near to Bommes in Sauternes. The top wines are rich and luxurious.... The post Best Sauternes 2018 wines: Where to look in a mixed year appeared first on Decanter. Ronan Sayburn MS steps into the role of Regional Chair for USA at the 2019 Decanter World Wine Awards. Ronan Sayburn MS is a judge at the at the Decanter World Wine Awards (DWWA) The post DWWA Regional Chair for USA: Ronan Sayburn MS appeared first on Decanter.